Strictly, to mean any of the species in the genera Accipiter, Micronisus, Melierax, Urotriorchis, and Megatriorchis. The widespread Accipiter genus includes goshawks, sparrowhawks, the sharp-shinned hawk and others. They are mainly woodland birds that hunt by sudden dashes from a concealed perch. They usually have long tails and high visual acuity. More generally, to mean small to medium-sized birds that are members of the Accipitridae, the family which includes the true hawks (Accipiters) and also eagles, kites, harriers, buzzards and Old World vultures. Loosely, to mean almost any bird of prey. The common names of birds in various parts of the world often use hawk loosely. For example, in North America, the buzzards (Buteo) are often called "hawks". The true hawks form the sub-family Accipitrinae and most are in the genus Accipiter. Hawks are among the most intelligent birds. They are believed to have vision as well as 20/2, about eight times more acute than humans with good eyesight. This is because of many photoreceptors in the retina, very high number of nerves connecting the receptors to the brain, a second set of eye muscles not found in other animals, and an indented fovea which magnifies the central part of the visual field. The goshawk is a medium large bird of prey in the family Accipitridae which also includes many other diurnal (active during the day) raptors such as eagles, buzzards and harriers. It is a widespread species throughout the temperate parts of the northern hemisphere. In North America it is named as the northern goshawk. It is mainly resident, but birds from colder regions of north Asia and Canada migrate south for the winter. This species nests in trees, building a new nest each year. It hunts birds and mammals in woodland, relying on surprise as it flies from a perch or hedge-hops to catch its prey unaware. Animals as large as hares and pheasant are taken. Its call is a fierce screech. This bird is a raptor with short broad wings and a long tail, both adaptations to maneuvering through trees. The male is blue-grey above and barred grey below, with a 37"-41" wingspan. The much larger female has a 42"-50" wingspan, slate grey above grey below. The juvenile is brown above and barred brown below. The flight is a characteristic "slow flap – slow flap – straight glide". In Eurasia, the male is confusable with a female sparrowhawk, but is larger, much bulkier and has relatively longer wings. In spring, he has a spectacular roller-coaster display, and this is the best time to see this secretive forest bird. The name "goshawk" is derived from "goose hawk" and may refer to this bird's barred plumage as well as its ability to take large prey. The sparrowhawk (Accipiter nisus) is a small bird of prey in the family Accipitridae which also includes many other diurnal raptors such as eagles, buzzards and harriers. It is a widespread species throughout the temperate and subtropical parts of the Old World. It is mainly resident, but birds from colder regions of north Europe and Asia migrate south for the winter, as far as North Africa and India. This species nests in trees, building a new nest each year. It hunts birds in woodland or cultivated areas, relying on surprise as it flies from a perch or hedge-hops to catch its prey unaware. This bird is a small raptor with short broad wings and a long tail, both adaptations to maneuvering through trees. The male is slate-grey above and barred reddish below. The male was formerly called a musket, and the gun called a musket was named after the bird. The female is much larger and is barred grey below, and can be confused with the similarly sized male goshawk - but lacks the bulk of that species. The juvenile is brown above and barred brown below. The flight is a characteristic "flap – flap – glide". The New World species formerly known as the sparrow hawk (Falco sparverius) is now called the American kestrel. 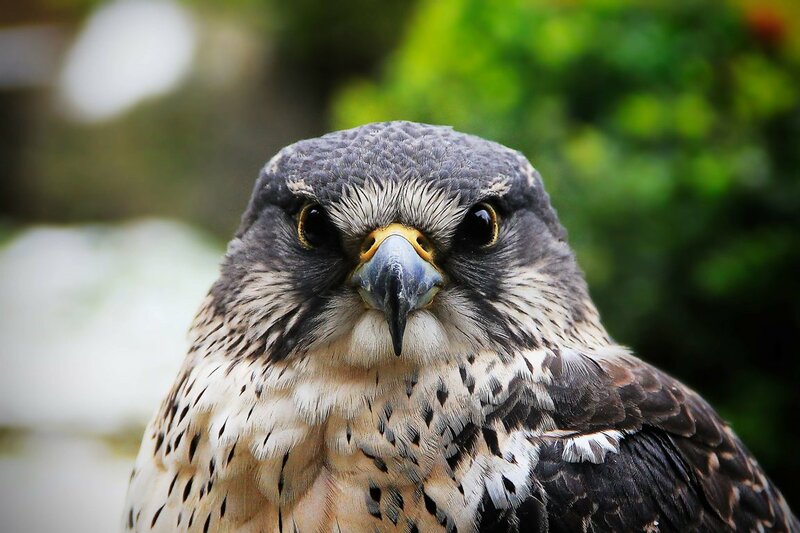 The new name is preferable, since this bird is not a hawk but a falcon. The sharp-shinned hawk (Accipiter striatus) is a small hawk. Adults have short broad wings and a long square-ended tail with dark bands. They have a dark cap, blue-grey upperparts and white underparts with red bars. Mature birds have dark red eyes and yellow legs. Adult females are slightly larger. They are easily mistaken for the slightly larger and lankier Cooper's hawk. Their breeding habitat is forested areas across most of North America and parts of Central America, although they are more common in the boreal forest. They build a stick nest in a large conifer or dense group of deciduous trees. In some parts of the United States, they are permanent residents. Northern birds migrate to the southern U.S. and south to South America. These birds surprise and capture small birds from cover or while flying quickly through dense vegetation. They often pluck the feathers off their prey on a post or other perch. They also eat rodents, lizards, frogs, snakes and large insects. This bird declined in numbers in the 1960s and 1970s, probably as a result of the use of DDT and other pesticides. Their population rebounded since and might even exceed historical numbers today. This is probably due to the combination of the ban on DDT and the proliferation of backyard birdfeeders in North America which create unnaturally reliable and easy prey for Accipiters. The greatest threats to hawks are habitat loss, hunting, collisions with automobiles, human interference with nesting activities, and poisoning from insecticides and industrial pollutants. Lead poisoning from eating food items that contain lead shot also kills a number of hawks each year.